Teach Ag Website NOW OPEN! Travel with me on the yellow brick road to visit with some of the characters of the Wizard of Oz. You and I will play the part of Dorothy. As we venture out, we encounter several characters. To encourage members to sign up for CoP, NAAE ran two contests in October -- one for the state with the most signups, and one for the individual with the most posts on CoP. Congratulations to California - the state with the most new signups - and to Robin McLean, a middle school agriscience teacher in New Jersey, for having the most posts by any individual in the month of October. The new and imporoved Teach Ag website is now up. 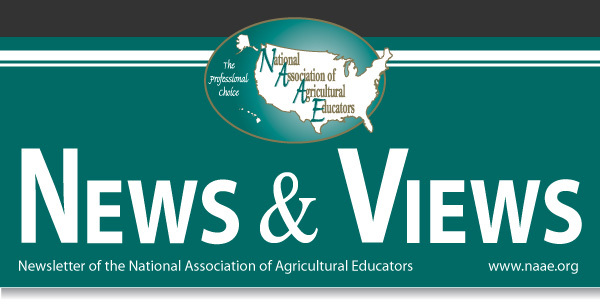 Find lesson ideas and other resources to help you celebrate National Teach Ag Day, join the National Teach Ag Campaign, search schools with a degree in agricultural education, and more, at www.naae.org/teachag. In Aaron Geiman’s Foundations of Technology class at North Carroll High School in Westminister, Md., students learn a new way to tie in agriculture with mathematics, science, technology, and communications, all focused around a sport with which they are very familiar.